Charts help you visualize your data -- a picture is worth a thousand words, after all. In GoFormz, adding a chart is quick and easy. 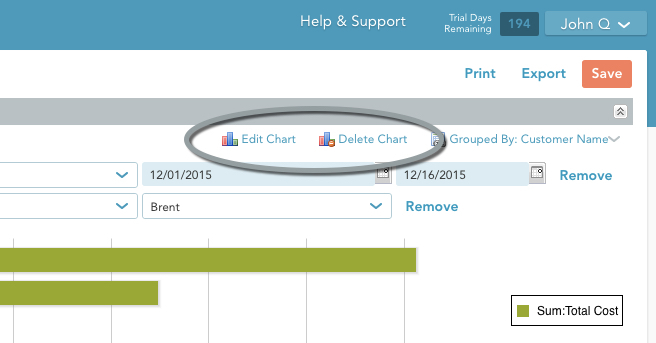 Below, we go over how to add and remove a chart. Note that your report must have at least one summary column in order to add a chart. See here for more on creating groups and summary columns. 1. Click the Add Chart button in the top right. The Chart Designer will open. 2. 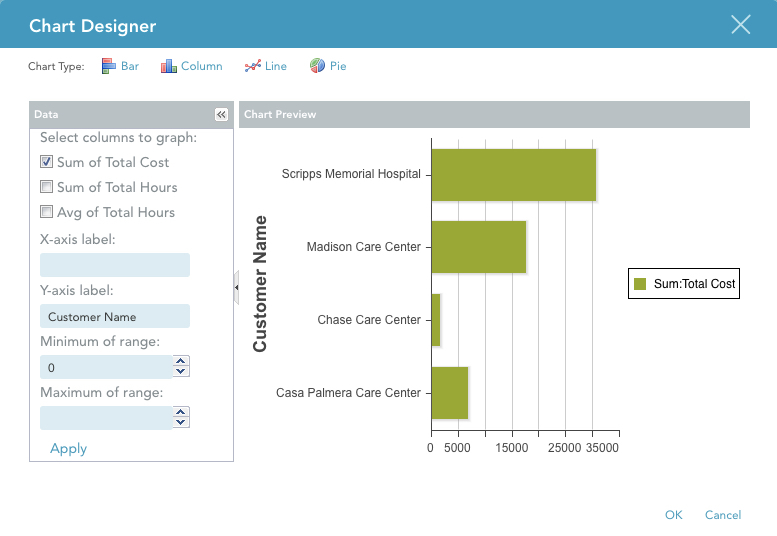 Select the type of chart you want to build -- Bar, Column, Line, or Pie. (Bar and Column graphs are identical -- they are just 90-degree rotations of each other.) In the example below, we chose Bar. 3. Select the column(s) you wish to chart. You will see a checkbox for each summary in your report. In our example, these are "Sum of Total Cost", "Sum of Total Hours", and "Avg of Total Hours". 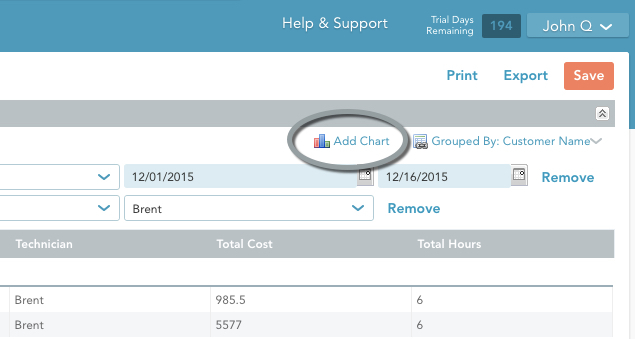 You can select any number of columns to include in your chart. 4. Use the X-axis label and Y-axis label fields to set your labels. In this example, we’ve labeled the x-axis “Total Cost” and the y-axis “Customer Name”. 5. Set the range limits of your axis using the Minimum of range and Maximum of range fields. If you don’t specify these, the minimum will default to 0, and GoFormz will automatically choose a maximum that best fits the data. 6. Click Apply to see your settings applied to the chart preview. 7. Repeat steps 3 through 6 as needed, until the chart looks the way you want it to look. 8. Click OK to exit the Chart Designer. Your chart will appear at the top of your report. To edit a chart, open the report containing the chart in the Report Editor, and click the Edit Chart button in the top right to open Chart Designer. Then just follow the steps outlined above for adding a chart. To delete a chart from your report, open the report containing the chart in the Report Editor, and click the Delete Chart button.